As always in publishing, as soon as one puts pen to paper the world changes again. The Cboe Vix day is now back down to 20, a level indicating the market does not expect much volatility for the next 30 days. Although there has been a large increase in public debt in the last 10 years, there is been an even larger increase in private debt, often denominated in dollars. Some people are concerned that emerging market debtors will be unable to honor the vigorish. For 45 years I have worried about public debt. Then the Bank of Japan bought back 50% of that nation's huge debt pile without inflationary consequence. The Federal Reserve bought back about 25% of US debt outstanding at the time, also without detectable result. I still worry about the mounting US national debt, but then I tend to worry about everything. I have not heard an adequate explanation from conventional or unconventional macroeconomists that explains why Japan can buy back half of its national debt and not start inflation. In the real world, there appears to be an escape hatch from mounting national debts. On the other hand, outside of mainland China, there appears to be no way to resolve mounting private debts (in mainland China, the People's Bank of China buys sour loans and bonds from commercial banks or other financial institutions). The reasoning is fine but the yield curve forecasting model is the only forecasting model in economics that actually works at a reasonable time frame. The sentence implies that successfully forecasting stock prices is indeed possible. I would love to see that evidence. Reference? It also implies in general that forecasting can be conducted successfully in economics which, a part from the ordinal yield curve forecasting model, does not appear to be the case. I know the econometrician brothers and sisters 'need' to eat but should economists mislead the public about the profession's forecasting abilities? I surmise that input prices (tariffs and ERP) are partly to blame for the uncertainty as it relates to this trade battle with China. Will it get resolved? Will it get worse? A big part of that working requires meaningful reforms on China's end when it comes to "acquiring" IP. It's a sore spot. In my estimation, without it, I see the current US administration ready to bring on the pain. It's already caused volatility that's unpleasant for many to endure and people are pressing the "GTFO" button while others are trying to ride the waves like those insane big wave surfers and literally eat it. I've never seen this kind of pattern of volatility. These wild swings are something else. Historical trends don't end up helping in much in anticipating direction. Yes, there's repeating cycles and presence of repeating structures (fractal) in historical data, but this is really new. "The big message of the moment is that risk is higher." That is the truth. Ha. Disagree. A crisis is exactly what the US requires in order to promote social cohesion and cooperation. Pushing NATO membership into former Soviet Union block countries was done for a number of reasons, perhaps to promote US agricultural and weapons sales but also to re-kindle the Cold War. Mission accomplished. The USA just recognized Jerusalem as the capital of Israel and continues to support the settlers in the West Bank and East Jerusalem because the September 11th 2001 attacks on New York City successfully brought Americans together in a common cause. Violent blow back is good for social cohesion. The USA requires overseas conflict because otherwise, the USA simply dissolves into one large, messy rent-seeking competition. Moreover, despite President Trump's Neo-Marxist-style fiscal policy of constant deficits, the USA still has considerable fiscal flexibility to respond to a true national crisis. I would like to know, in your view, how long/short the long/short run is (say, are 5 years the long run?) for clarification of your argument. As uncertainty seems persistent (follows random walk, but looks like AR(1)? See EPU index for US below), I am not sure whether "we live in a time of great uncertainty." After the crisis of 2008, we always live with great uncertainty, don't we? In sum, the ups and downs of uncertainty (or volatility, slope of yields curve, TED spread, ...) seems less informative to "predict" the next recession than before. John writes that “In my view the US has gotten an extra percent of growth, mostly from deregulation and a bit from the incentive effects of the tax cuts.” We can quibble about the magnitude but it’s hard to deny that deregulation and the (smallish) incentive effects of the tax cut both contribute to increasing productivity and a resulting growth spurt. But John goes on to say that “these (the growth enhancing benefits of deregulation and tax cuts) are over, and further reform is unlikely. So a growth slowdown is certainly in the cards.” I’m not so sure. What if changes in incentives don’t just cause a one-shot increase in productivity? 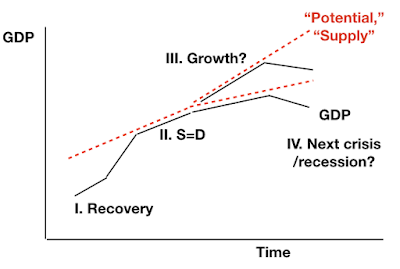 What if they change the pattern innovation and the development of new ideas which then—as Romer-like analysis suggests—causes a permanent increase in rates of growth? I’m not claiming this is obviously true, but is John really certain that it isn’t? 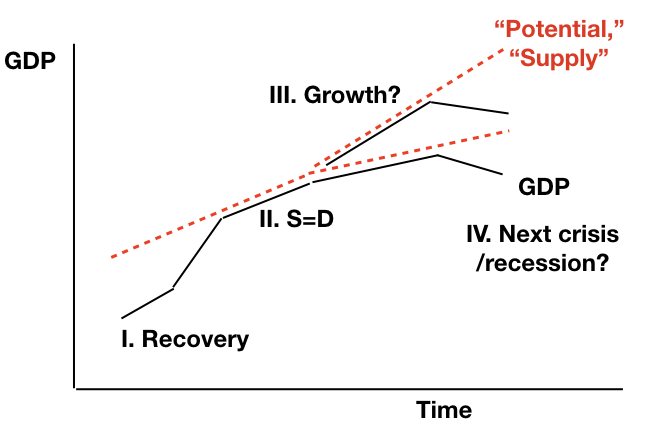 So, if a debt crisis accelerates, where is the safe haven, or better, the opportunity? The haven(s) can be an asset class, a warm secure island with benign cultural and demographic attributes, take, or some other form I can’t presently imagine. How does one manage risk in this environment? What assets does one buy with minimal correlation to equities and debt? I am not yet persuaded by bitcoin or gold but my formerly tightly closed mind is opening somewhat. Thanks for the full article. But there is more growth possible than you now assume. "The labor force participation rate, at 63.1 percent, changed little in December, and the employment-population ratio was 60.6 percent for the third consecutive month. Both measures were up by 0.4 percentage point over the year. (See table A-1.)" The US can increase the employment rate -- by putting people who are not working, yet not counted as unemployed, to work. For instance, replacing 900k illegals working for cash and not being counted, with 900k citizens (or 400k?) who previously were not looking for work (not unemployed). I claim that with the right policies, including more pay & less regulation, the employment rate can get up to 65%. Main point: employment rate, 63.1 to 65 or 60%, is now more important than unemployment rate. And shows employment growth is still possible. 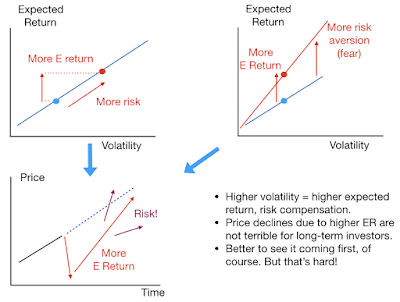 Volatility increases when common stock prices decline; options become more valuable when volatility rises. CBOE VIX is not a leading indicator of the volatility of returns--at best it might be a current indicator, at worst a lagging indicator. The construction of VIX is problematic and interpretation of the index is neither straight-forward nor lacking in bias. It should not be relied upon for quantitative analyses. If the U.S. government is not capable of responding to a crisis, then we are truly up the proverbial creek without a paddle. What does Dr. Cochrane know that the rest of us don't? How has he arrived at that conclusion? The assertion, "Twenty percent volatility on top of a 5 percent average return, means that every other year is likely to see a 15 percent drop." is not likely to be literally true under the assumptions stated. If we take the underlying price to be stochastic and specify that it follows a geometric Brownian motion with volatility parameter 0.20 and drift parameter 0.06879016, the expected 1-year geometric return is 5%. The probability of the investment return in any given year being loss of 15% or more is 1 in 6.87 (0.1455%). 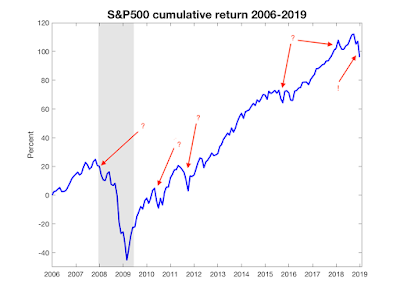 The probability of a compound event in which the investment return is a loss of 15% or more in the second of two consecutive years when the return in the first year is either a gain or a loss of less than 15%, is 1 in 8.04 (0.1244). 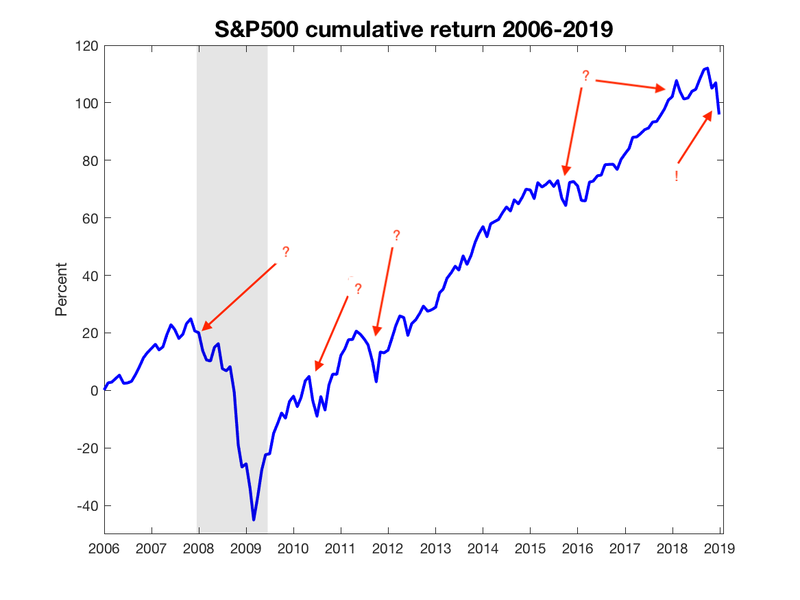 The probability that the investment return will not be loss of 15% or more in the second year, given that the return in the first year was either a gain or a loss of less than 15%, is 0.876 (100 in 114). The probability for a 15% or greater loss every other year for a geometric brownian motion price process (stock price model) falls outside the range of 66% to 100%, and if we agree with the IPCC's notion of "likely", the recurring 15% or more annual loss every other year ought to be considered "unlikely". Hi David, great comment but how did you claculate the drift and the probabilites? The calculation of the drift parameter is based on the expected rate of return specified by J Cochrane (5% per yr) and the magnitude of the volatility parameter given by J Cochrane (20%) in the article (see the quoted passage in my original remarks, above). The calculation is based on application of Ito's Lemma to a geometric Brownian motion process which is assumed to be a fair model of the stock price movement. This is a well known model and is written up in, for instance, Wikipedia (see, https://en.wikipedia.org/wiki/Geometric_Brownian_motion ). The estimate of probability of a 15% loss in any given year was determined by quadrature using the density function for a geometric Brownian motion with drift parameter estimated using the expected rate of return (5%) and volatility (20%). The drift parameter (alpha) in this case is the expected rate of return (5%) plus one-half the square of the volatility. The probability of a 15% negative return every other year is estimated by the product of the probability of the return in one year being less than or equal to negative 15% and the probability of the return in the prior year being greater than negative 15%, i.e., if P = prob(R =< -0.15), then the probability of the return being negative 15% (or worse) every other year is P*(1-P). "Twenty percent volatility is normal. Twenty percent volatility on top of a 5 percent average return, means that every other year is likely to see a 15 percent drop." "...5 percent average return,...." is taken to mean "5% expected annual return". The volatility specification of 20% is generally accepted as representative of the broad U.S. stock exchange index variability in a one-year period. 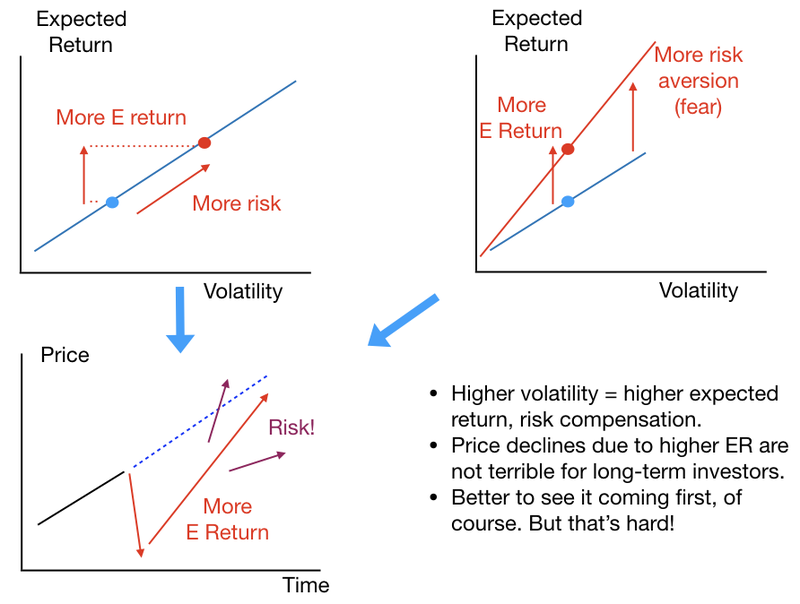 See, for example, R. Dixit and R. Pindyck, Investment Under Uncertainty, Princeton Univ. Press, Princeton, NJ, 1994 [ https://press.princeton.edu/titles/5474.html ]. The quadrature method for calculating the cumulative probability distribution, F(x), is based on a trapesoidal approximation. The minimum value of x is taken to be x(t=1)=0.010 and the maximum value for the purposes of calculating the area under the p.d.f. to left of x(t=1)=850 when x(t=0)=1000 is x(t=1)=855. The basic assumption is that the stock price evolves with time as a geometric Brownian motion, i.e., dX = alpha*X*dt + sigma*X*dB(t), where X = stock price, dt = time infinitessimal increment, dB(t) = Brownian motion infinitessimal increment at time t. Expected values for the process are based on Ito's Lemma. The GBM process is a special case of a broad range of stochastic processes, and as such it is a restrictive assumption. It's sole use and importance is for ease with which modelling and estimation can be undertaken with limited computational effort. Apologies if this explanation is over long or excessively wordy. Can you share the evidence you have that "deregulation" has contributed significantly to growth?